In the building of the Hofplein theater is a beautiful piece of art: The ‘Karel Appel’ Wall. 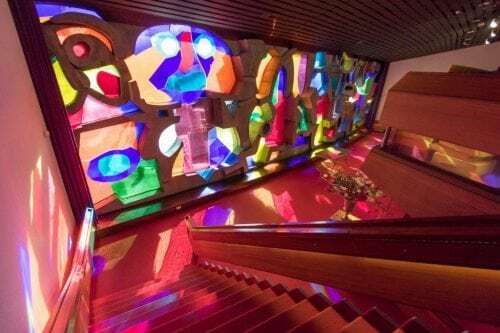 A colorful ‘glass in concrete’ wall that comes to life through intrinsic light during the daytime. Now there is the possibility to let it shine at night as well, a nice scene for a visitor or passerby of the Hofplein. The ‘Appel’ Wall is therefore a tribute to the square that is ill illuminated in the evening. Karel Appel’s characteristic ‘glass-in-concrete’ work of art not only marks the theater’s frontage, but also creates spectacular light in the new public area during the daytime. The idea for the exposure of this Apple Wall by night is quite simple. Rapenburg created a design whicht illuminates the wall as a whole so that the wall will also radiate from the square. In addition, we made it possible to highlight some details of the wall. By doing this with spotlights we created light fall of colored glass on the ground of the square. This enhances the effect that the glass in concrete can have on the square and by programming a dynamic effect the details come to life.